A Baraisa was taught in the academy of Rabbi Yishmael: Why is the [upper part of the] ear hard, but the earlobe is soft? So that if a person overhears something inappropriate, he will be able to bend the lobe in the ear canal [and block out the sound]. In 1979 Stephen J. Gould (d. 2002) and Richard Lewontin published a paper that would rock the world of evolutionary biology. They suggested that evolution by natural selection could not explain every feature of an organism. Sometimes, a feature is a non-functional byproduct of evolution, rather than a direct result of it. Gould and Lewontin give an example from the world of architecture, from the spandrels in the church of San Marco in Venice. A spandrel is a by-product, formed when a dome sits upon a rounded arch, shown in the pictures below. 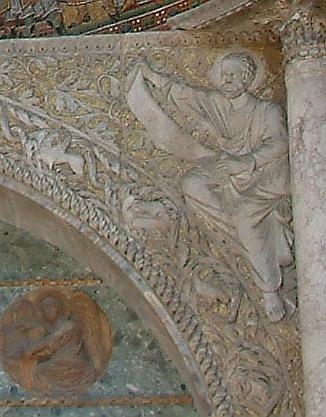 "San Marco Spandrel" by Maria Schnitzmeier - Detail of Image. we are tempted to view it as the starting point of any analysis, as the cause in some sense of the surrounding architecture. But this would invert the proper path of analysis. The system begins with an architectural constraint: the necessary four spandrels and their tapering triangular form. Just as spandrels are accidental, some features of an organism are not the result of natural selection, but instead are "spandrel-like"in their origin. This was not to suggest that natural selection was incorrect; only that it was not a complete explanation of an organism's form and behavior. A: Ear of a treeshrew (Tupia) B: Ear of a new world monkey (Cebus) C: Primate (& Human) ear and its constituent parts. From Friderun Ankel-Simons, Primate Anatomy: An Introduction. Academic Press 2010. We humans share much with our primate cousins. We share an opposable thumb; we share much of our DNA, and we share our ear anatomy. Rabbi Yishmael teaches us to put that ear anatomy to good use.